Two IAB Lecturers will be speakers at the International Conference (25th-27th October 2018) in Paris, organised by EASTP - European Association for the Study of Theatre and Performance, the main European association in the field. The purpose of EASTAP is to bring together in Europe scholars, artists, performance makers and stakeholders in order to encourage and promote multiple methods and approaches in the domain of theatre and performance, including all live performance (theatre, dance, opera, puppetry, circus, performance). 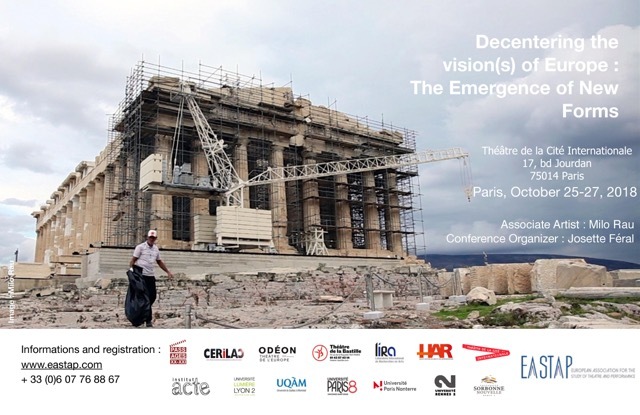 The conference, titled “Decentering the vision(s) of Europe: The Emergence of New Forms” and hosted by the Théâtre de la Cité Internationale, will see Armando Rotondi, Associate Professor in Performance and Programme Leader of the MA Acting, and Valentina Temussi, Lecturer in Movement, delivering two papers on acting tradition on the 25th and the 27th of October.